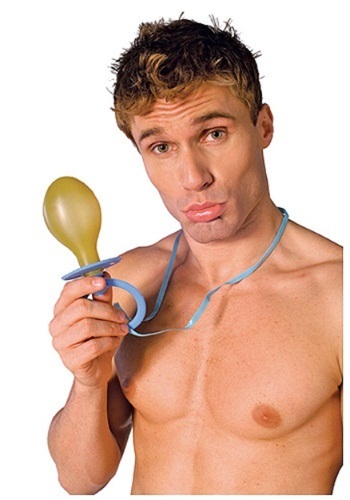 If you're going to act like a giant baby then you're going to need an equally as giant pacifier. Because if end up having a temper tantrum you'll need to calm yourself down and the best way to do that is to have your favorite binky with you. At least that’s how our kids settle down. Just pop that pacy in their mouth and they are satisfied! But what’s a big baby to do? Those little pacifiers are so small a big baby could eat them for breakfast. The need a pacifier that’s as big as they are to handle their larger-than-life tantrums. Pick up this great accessory when you're also picking up one of our great baby costumes as well! This extra large pacifier is made of plastic and has a ribbon around it so you can wear it around your neck. You wouldn’t want to lose it or have it drop on the ground, would you? Well, if your mommy is around she can always put it in her mouth to get all the dirt off (what, your mom didn’t do that?) so that you don’t get any bad germs, but what big baby wants their mom tagging along all the time? It's a good accessory to the mask.